This style of Dairy Queen sign — seen here on the old alignment of U.S. Route 33 north of Ohio University — is becoming more rare these days. 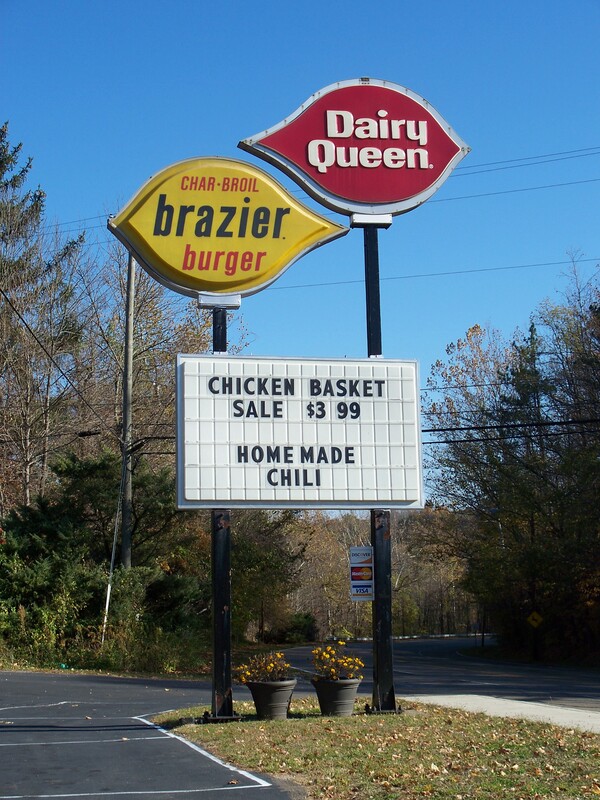 While mostly thought of as a 1970s design along with the accompanying red mansard roofs, the word Brazier started being used at DQ locations with a grill as early as 1957. This was started by a franchisee in New York who realized DQ needed to standardize its restaurants and distinguish between those serving just desserts and those with fuller menus. Ironically, it is only now that Dairy Queen is finally taking standardization seriously and it ended up getting them into trouble. Recently, the company endured a black eye for trying to force its location in Williams, Arizona on old U.S. Route 66 to remove its even older "blue cone" style sign in favor of a new one. Thankfully, the resulting uproar made DQ change its mind. Let us all hope it is a lesson well-learned and long-remembered at DQ headquarters. Americans might be addle-minded about many brands and need consistent reinforcement but Dairy Queen isn’t one of them. Posted in Retro/Vintage, signTagged Americana, design, history, nostalgia, photography, restaurantBookmark the permalink.